This article is part of a year-long feature - watching and blogging about twenty acclaimed, cult, challenging and rare films over the course of 2013. The full list of films can be found here. Number two: Jean Renoir's belatedly beloved pre-war satire La Règle du jeu. Perhaps we take it for granted, but we're living in such a wonderful time to be a film fan. Sure, there are countless lost films from great masters, and we probably won't ever get to see the full version of von Stroheim's Greed (another film on my list for 2013 - fingers crossed the full version shows up in an asylum closet before December ends). But we also have such easy access to so many of the best films ever made, as well as the gift of all those wondrous contemporary films still showing up in theatres on a near weekly basis. Jean Renoir's La Règle du jeu is perhaps a definitive example of how lucky we really are. The story is well-covered elsewhere - the film, in it's full version at least, was effectively lost for near two decades after its premiere screening heralded a commercial and critical disaster. The film was recut, banned, swept under the rug, destroyed in a fire etc... It was only the work of cinéastes in later decades - members of La Nouvelle Vague ensured its wider dissemination - that allowed Renoir to restore his film to a near enough complete state in the 1950s. Now the film stands proud as the only film that has featured in all of the Sight & Sound decennially polls since that institution's inception. And we can all watch it on DVD. Of course, DVD is not the same as the big screen, but no screen can hide the boldness and potency of Renoir's visionary comedy. Ostensibly a satirical account of an anarchic house & hunting party held by a group of upper-class French folk, the film is much more than a simple farce. Indeed, the film consistently hints at a darker side to these festivities, and it inevitably leads to a violent and tragic conclusion. The film predominantly focuses on a couple of love triangles (sometimes spiraling into more quadrilateral dimensions), but through the increasingly unhinged actions of our 'heroes' Renoir probes the way French society had abandoned their morals, decency and compassion in the early twentieth century. Renoir's observations were, of course, disturbingly precient - France collapsed mere months after the film's completion. It's unwelcome reception in Renoir's native land was largely down to how close to the bone its scathingly deconstructive themes actually were. But of course it's really funny too, which helps. Equally impossible to ignore is the film's madly energetic mise-en-scene and cinematography. 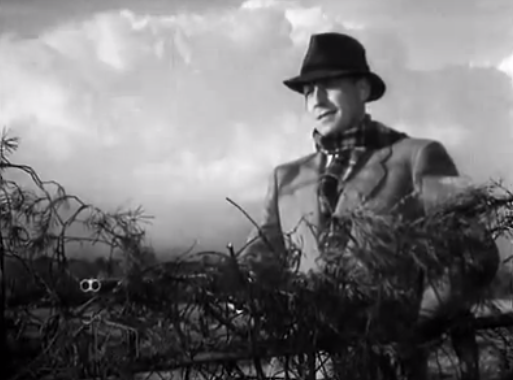 Renoir's spirited and (deep) focused visualisation, with the assistance of four credited cinematographers, allows the film to still feel absolutely unique well over seventy years later. The camera is rarely static, instead capturing the anarchy in all its chaotic majesty. Some shots last for over a minute, dynamically shifting and panning throughout. One beautiful sequence sees sweeping spotlights illuminate the characters, jumping from one set of lovers to the next with great urgency - and the camera always follows. It must surely have inspired Guy Maddin's work on Keyhole recently. In other scenes, the cutting is much more rapid. The film's most famous scene sees cuts every two or three seconds as the guests go hunting. Animal lovers look away - this makes for brutal viewing as rabbits and pheasants are slayed without mercy. It has lost none of its ability to shock, and acts as a stark contrast to the frivolous actions of the shooters elsewhere. It's also a reminder of the film's darker, more sinister undercurrents - the selfishness of these wealthy people leading to violent repercussions for those creatures that really don't stand a chance. The vitality of the cast is a further determiner towards the film's endlessly peppy pace and tone. The tension that builds between a sleazy poacher (Julien Carette) and a put-upon gameskeeper (Gaston Modot) over the latter's wife (Paulette Dubost) allow for the film's most potently comedic moments, in large part due to the performers' commitment to the farcical confrontation. Elsewhere, several people pine over Christine (Nora Gregor). Amongst said piners is Renoir himself playing Octave, an old friend of Christine's. He's probably the most likeable of the bunch, and there's a definite sadness to his character as he resigns himself to assisting others to win the heart of his beloved. Renoir wrote his own rules with La Règle du jeu, and they ensure the film remains as watchable and invigorating as it must have been back when it was originally produced. More than a lot of films, you can also recognise the direct influence it had on later productions - Luis Buñuel, for example, must surely have gorged on it prior to crafting his own bourgeoisie satires. Many detrimental forces threatened to bury this film, but how lucky we are that we can still experience Renoir's cheekily ambitious opus in almost all its glory.